85 Value For Money Better Options? Flat 5910 off on On Max.Flat 5910 off on On Max. Extra BUP on Exchange offer.Extra BUP on Exchange offer. Samsung Galaxy On Max comes in with a huge screen size. Though the display is bright and attractive, it is a bit tough to handle. Battery life is also good. Camera quality is also upto the mark. Comes in close comparison with On next but On max has a better camera. Both mobiles don&apos;t differ by much. You can go for any one of them. It has an amazing f/1.7 aperture camera which is usually bundled in flagship cameras at most. If someone&apos;s looking for a camera for low-light photography, this is the best in the market right now! And for a budget price. Samsung is coming back to deliver its best with this mid-range phone. This is a phone with people who&apos;s main factor while buying is the camera, it has a great low light camera feature. A few minor battery problems and not satisfactory fast charge, but still is a great phone. The Galaxy On Max feels good to hold. It comes in two different colours: Black and Gold. The phone have 5.7-inch display .Owing to the screen space and resolution, multi-media shall be a treat on this phone. The speaker is loud enough, it is positioned on the right side of the phone above the power button. Comes in close comparison with Galaxy On Nxt but On max has a better camera. Both mobiles don&apos;t differ much. You can go for any one of them. 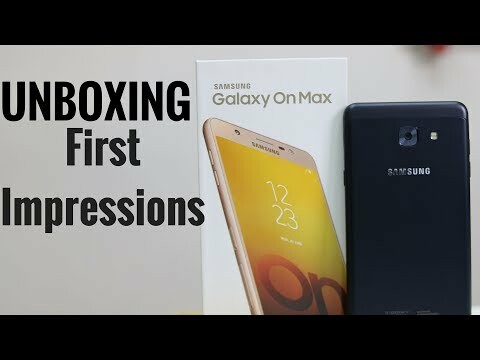 8 Pricebaba users have written their experience with Samsung Galaxy On Max. If you own Samsung Galaxy On Max, please do leave your feedback too. Lowest price of Samsung Galaxy On Max price in India starts at Rs. 10,990 Samsung Galaxy On Max is available on Flipkart at Rs. 10,990. Prices updated on 25th April 2019. The Samsung Galaxy On Max is an offering by the South-Korean brand in its On series. It is priced below the Rs. 20,000 price range and competes with other phones including the Moto G5S Plus and Gionee A1. Let's take a look at what the On Max offers to its users. The Galaxy On Max bears a premium design and feels good to hold. It comes in two different colours: Black and Gold. The phone fits a 5.7-inch LCD display which bears a Full HD resolution of 1920 x 1080 pixels. Owing to the screen space and resolution, multi-media shall be a treat on this phone. Although the speaker is loud enough, it is positioned on the right side of the phone above the power button. Camera performance of the On Max is quite good as it comes with a 13-megapixel rear as well as front camera. The rear camera has an f/1.7 aperture which is flagship level and can click some really good low-light pictures. Even the front selfie camera is capable of clicking good selfies. The phone has an LED flash on both front as well as rear. On the performance front, the Galaxy On Max packs in an octa-core 2.39GHz MediaTek Helio P25 chipset. The processor is coupled with 4GB of RAM to carry out multi-tasking. On the storage front, the phone has got 32GB of internal storage which can be further expanded through a microSD card up to 256GB. The phone runs on Samsung Experience operating system which is built on top of Android Nougat. Battery capacity of the Galaxy On Max is 3300mAh which promises to last up to a day of full usage. For connectivity purposes, the phone has got 4G LTE, 3G, 2G, WiFi, Bluetooth and VoLTE among other connectivity options. It also has USB OTG support to transfer files directly from a pen-drive. To get an in-depth view about the phone, you can also read the Full Review of Galaxy On Max. 1. Will this phone work with Reliance Jio network? Ans: Yes, this phone supports VoLTE out of the box and should work well with Jio network. 2. Does the phone have a Hybrid second slot? Ans: No, it has 2 slots for SIMs and a dedicated slot for microSD card. 3. What type of charging connector do I need? Ans: This phone uses the standard Micro USB port for data syncing and charging. 4. Will this get further software updates of Android? Ans: Yes Samsung phones usually get gradual Android updates and this phone shall be no exception. 5. How is the camera for selfies? Ans: It has a 13MP front camera so expect a decent image quality for selfies. 6. Does the phone support USB OTG? Ans: Yes, the phone does support USB OTG. 7. Is the battery removable? Ans: No, the 3300mAh battery of the phone is not user removable.